On leaving the village of Shirenewton the route follows open pasture down the Golden Valley which made up Shirenewton golf course for some years. 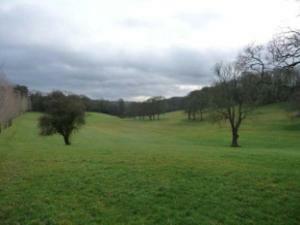 It then enters the mature woodland of the Dinham Valley where a castle once stood. The return to Shirenewton rises through further woodland, interspersed with open fields - remember to turn and enjoy impressive views out to the Severn Estuary. Points of interest include the remains of Dinham Castle and views over the Severn Estuary. The number 63 Cwmbran to Chepstow bus stops in the village. Contact www.travelinecymru.info or telephone 08712 002233.